What is up Everyone? Chandler, Evan, and Bryan sit down to talk about the Warzone Atlanta Tournament that was held back in November. Evan and Chandler break down their games, talk about the fun shenanigans that happened at the tournament, the awesome opponents we went up against, and some of the beautiful armies that made their way to the tournament. This is one of the premier tournaments in the nation and we love going to hang out and play in it whenever possible. Recapping a hell of a Tournament with the boys. What is up Everyone? Over a month ago, Chandler, Evan, and Bryan sat down to talk about Genestealer Cult, Tourney Prep, some games that we got in, and the amount of painting and hobbying we had accomplished. Unfortunately, That episode was lost in the warp, UNTIL NOW. The guys sit down almost a month out and after not having done a podcast in a long time, it turned into one of our old fashioned podcasts. Lots of rambling, lots of talking, and of course, lots of Nids. Even the Lost Episodes are eventually found. Yo, this is Ronaldo, the greatest Tyranid Player in the history of mankind. If you don’t know you will soon. For this, my first post, I wanted to go through the list I’m going to be taking to Warzone Atlanta, and why it’s just flat out awesome. I mean, obviously, because it’s Nids. I know a lot of people complain that the Nid codex is bad, or it’s underpowered, or whatever. It’s all crap. 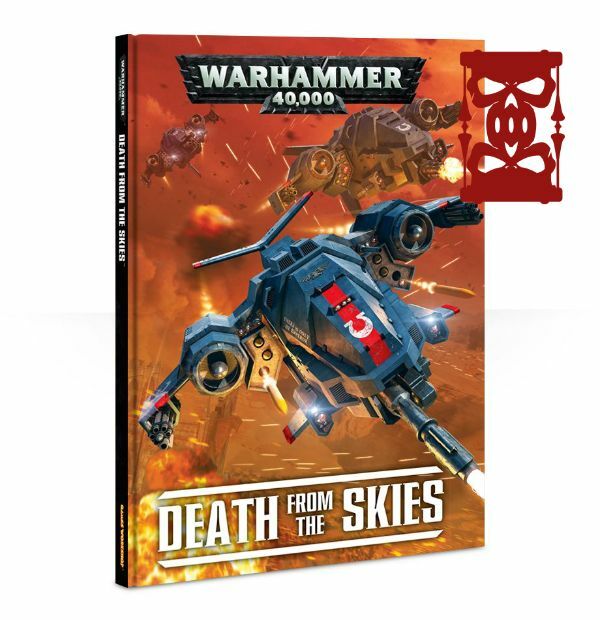 They’re pretty clearly just not seeing all the great stuff Games Workshop has given us Nid players that we can use to totally dominate the galaxy. What is up Everyone? This week on the Podcast, Chandler, Bryan, and Evan come together with Andrew and Chad from the Heroic Intervention Podcast to give the most in-depth Codex review for the Genestealer Cult. We dive into everything from Winners to Winners to the couple of losers from this Codex. 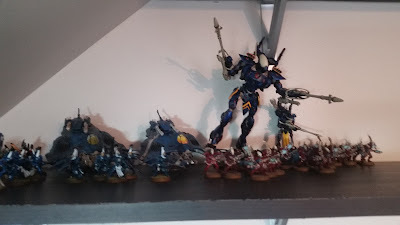 We talk about some of the initial lists, some of the initial controversy with some of the rules, and have a good time connecting with another member of the Greater Hive Mind and his Dark Eldar Brother. 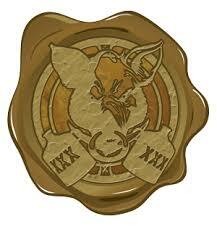 It is probably the most comprehensive podcast we have ever given for a Codex. 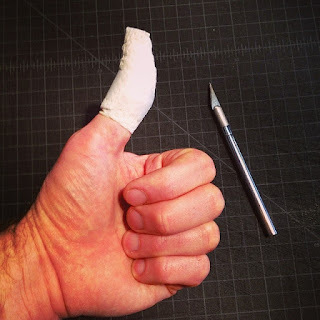 No need to roll a dice for this Heroic Intervention, it is automatic! What is up Everyone? This week on the Podcast, Chandler, Bryan, and Evan come together to talk. It has been a long time and the boys have been busy. Evan returns from NOVA with some insight, Bryan is getting ready for The Renegade, and Chandler and Evan talk about their initial prep for Warzone Atlanta. Since the last show, Genestealer Cult drops, Blood Angels have been summoned, and 40k is crazier than ever. The boys jump from topic to topic after a long hiatus. Episode 44 goes from Point to Point before bringing it home. For part three of my NOVA recap, I wanted to finally get into my own experiences at NOVA. 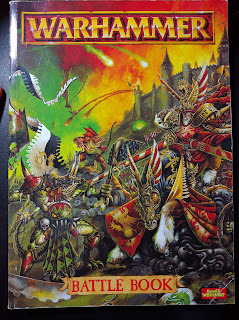 Part 1 was a pic dump primarily from the 40k hall, while part 2 dug into some of the stats from the 40k GT. I'll cover my games briefly, and hopefully discuss them a bit more in an upcoming podcast, and overall share my experiences at one of the premier hobby and gaming events out there. For this part of my NOVA recap, I wanted to dive back into my stat analysis role from Torrent of Fire and break down the results. Field of Fire took a crack at the stats from the event, and I'll probably be retracing some of that ground but looking to dig a little deeper. Part of this is massaging the data a bit to get slightly more accurate results. For example, Chaos Space Marines as listed did very well, but we need to differentiate between any Chaos Space Marine primary lists and those that were actually Renegades primary. A bit behind my normal schedule, but finally time to begin the NOVA Recaps. As always, I had a total blast at the event, and might have had more fun this year than in previous years. For this first post I'm just going to do a bit of a pic-dump of many of my favorite photos from the weekend. Amazing how time flies; NOVA is less than a week away at this point (more exact time in the side-bar counter), and I still have a good bit to do (to the surprise of no one). I've got a couple projects I need to finish up before I head out the door to NOVA, and some more I will probably be working on in the hotel room. What is up Everyone? This week on the Podcast, the boys welcome back Ben Cromwell. Ben is an awesome painter who is helping Evan with the FTGT Painting service, but he joins us to talk about the Iron Halo GT. This is an ITC Major Event in Barlesville, OK. He also talks to us about his thoughts on Deathwatch and the Necron FAQ. He also drops his ideas about Eldar and what he is planning to run at the Iron Halo GT. We are excited to talk to him, get the updates from Ron and Evan about their lists for NOVA, and Bryan and Chandler are still working towards their individual tournaments coming up in the fall. Ben joins us for fun, shenanigans, and to talk about a cool tournament for a great cause. I just recently completed this absolutely awesome "miniature" commission: a Warhound Titan. This was an absolute monster of a project and I'm really happy with the final result. What is up Everyone? This week on the Podcast, the boys welcome in Phil R. who is the co leader of the Warhammer 40K GT and Warhammer Invitational Tournament at the NOVA Open. He stops by to give us some knowledge on the Tournament, some of the rules and mission setup, as well as break down some of the cool hobby, tournament, and little tid-bits of information that could help you have a great weekend at a spectacular event. The NOVA Open runs Labor Day Weekend September 1st - 4th, and if you need any additional updates see the show notes below. Phil joins us with plenty of knowledge towards the two big events. As is my norm at this point, I'm still debating what list I'm going to take to NOVA this year. That said, I'm coming closer I think to settling on something, which is good seeing as we're just a little over a month out. What is up Everyone? This week on the Podcast, the Crew is BACK! Bryan makes his grand return to the podcast and just in time to run down his ideas for the upcoming tournaments that we are all playing in. With Evan and Ron heading to NOVA, Evan and Chandler heading to the Warzone, and Bryan stomping into Renegade, we have a lot of list ideas, a lot of stuff to finish, and a lot of BS to sort through. We also dive into some of the differences when getting ready for tournaments and some of the differences from tournament to tournament. It is a Competitive Grey Tide washing ashore. For today's Miniature Monday, I wanted to share with you a part of a Dark Eldar commission I recently completed. These are the five Reaver riders. I also recently finished painting 30 Kabalite Warriors for the same army, but they're not based yet so I can't call them completely done. This post is a status update on my Tyranid painting progress for NOVA. If you missed my first post on my army and work remaining, you can find it here : http://ftgtgaming.blogspot.com/2016/06/ftgt-ron-back-in-2-part-epoxy-putty-mix.html. What is up Everyone? This week on the Podcast, Evan, Ron, and Chandler sit down and discuss some of the recent games they were able to get against each other when Chandler got married. Evan and Chandler talk about their first game that they had: Space Wolves and Knight vs. Raven Guard and Ron and Evan discuss their game: Nids vs. Raven Guard and Nids vs. Necrons. Evan runs down his time at a recent tournament in the Tri-City Area of Tennessee, and finally we talk a little bit about NOVA missions. When Dice get to fly, good times are had by all. Last weekend I made a bit of a trip to Mulligan's for their June RTT, which was an ITC event with 16 players showing up. I had decided to go pretty last minute, so I took a Necron list I was pretty comfortable with and took a Wraith-star list with the Start Collecting! Necrons formation, the Retribution Phalanx. This week I've gone back to the Kabalite Warriors from about a month ago and have been working on the details. Here is my fourth flying hive tyrant pose conversion. This guy has been sitting around ~95% finished for a while. I finally got around to finishing him, and dug up some WIP shots for a post. Hey guys, back again for another WIP Wednesday update. Things have been a bit slow the last couple weeks, despite knocking out the Tankbursting Mawloc over the weekend. The Warhound was temporarily shelved, but I should be getting back to him next week. I recently had a chance to finish up a model that's been brewing for over a year now - another Mawloc making a dynamic entry. This one is bursting up through an Ultramarines Rhino. Ron here, back from a somewhat lengthy 40k break. I hung out with Evan and Chandler last weekend and managed to sneak in a pair of 1850pt Nova style games. These were my first 40k games in 10 months, and they reminded me that I actually do still enjoy playing the game . 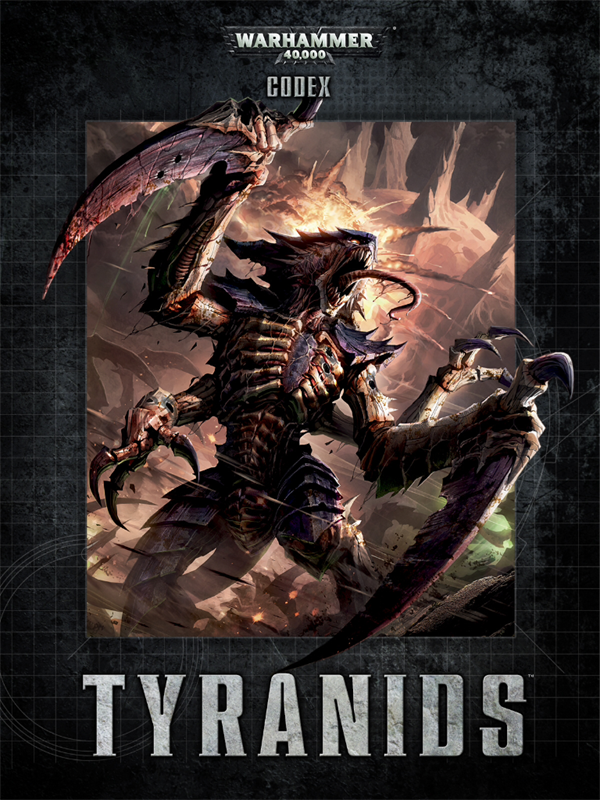 Yes, some rules are creeping more than a guy in a white van with a mustache, but Tyranids are still my first tabletop hobby love. As Sheryl Crow put it, the first cut is the deepest. 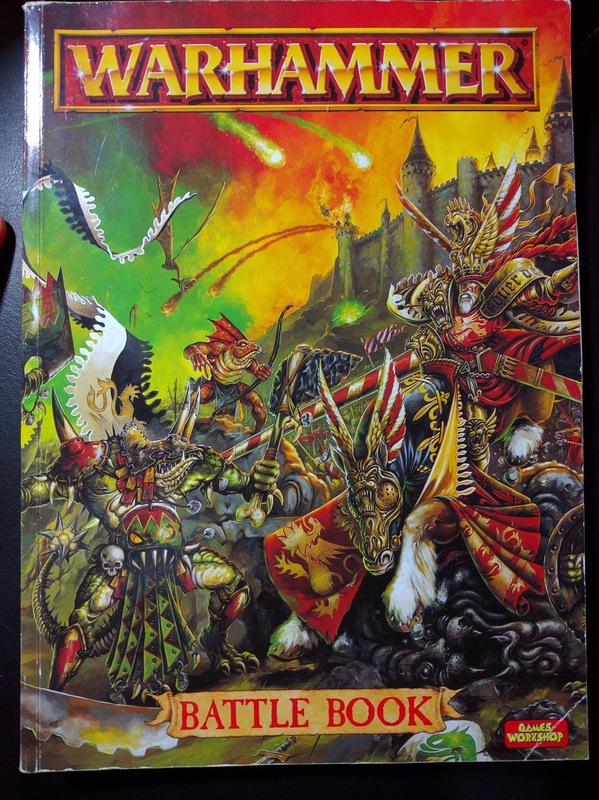 I was digging through a box of old books recently and came across the Warhammer Fantasy Battle Book from Fantasy 5th Edition. Hi all! Back again with another WIP Wednesday from the FTGT Painting Desk. 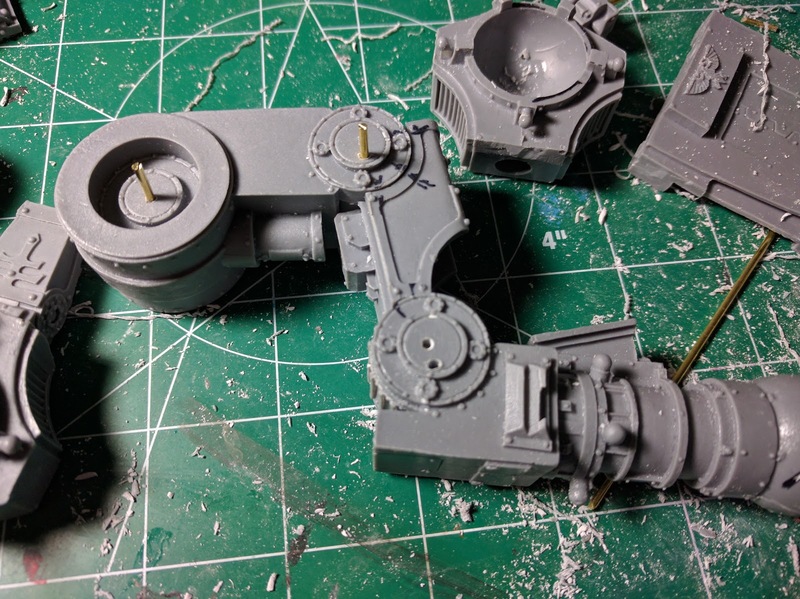 I've been putting in a lot of the unglamourous early work required in a big kit like this Warhound Titan. Last week was literally simply laying out pieces and cleaning flash and mold lines from larger pieces. 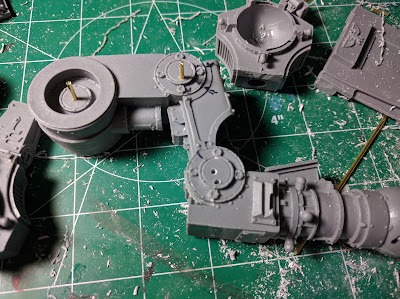 This week I've finally been able to begin the process of assembly. What is up Everyone? This week on the Podcast, Evan, Ron, and Chandler sit down to talk about the hobby, what they have been working on in the last couple of weeks, and talk about the army list. The Boys discuss their Space Marine lists using the New Space Marine Supplement, their wish lists for Nids, and then talk about some of their ideas about what GW could be doing in the near future. They also discuss thoughts on some upcoming tournaments, and Evan talks about his painting service FTGT Painting. The Lists are out, and clearly, the Nids need some help! NRVCon 2016 is in the books, and while the 40k tournament was a bit smaller than we hoped, it was still a great time. Thanks to everyone who played. You can see the results on Torrent of Fire. Also, before I get into the event, a ton of thanks to the TO Elle for running the event. I had three great games and ended up taking home Renaissance Man, being runner up, third in BPs, and second in Paint Score, but more on that toward the end. Over in my FTGT Painting Studio I've been working on a Dark Eldar army commission for Bryan. It's taken a bit longer than I originally anticipated, and is still ongoing, but I have some of the first completed models to show off. The army is being done in the Kabal of the Flayed Skull scheme. 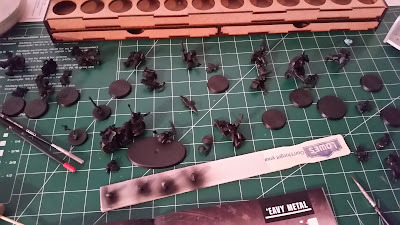 I've finished off the Venoms and Razorwings, and started on the Reavers and Warriors. 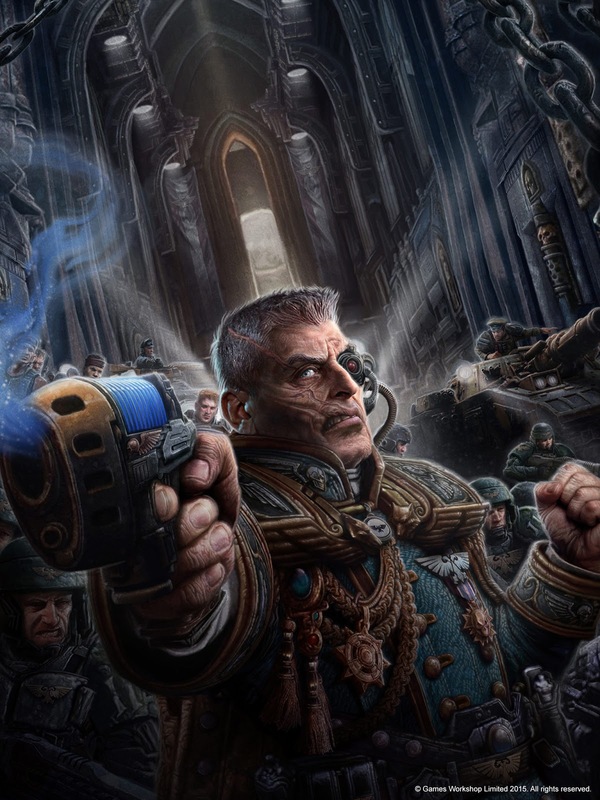 Facing the Grey Tide Podcast - Episode 36: We Are BACK! What is up Everyone? This week on the Podcast, Evan, Bryan, and Chandler are back at it again. After a little time off because of some changes in our lives, the boys are back to talk about everything that has kind of happened in the last couple of months. We talk about Evan's new Painting Service, discuss the thoughts on where GW is going, Talk about the new books/formations that were rumors at the time, and finish out by talking about the hobby in our lives. So join us as we roll through everything in our minds. The boys are unleashed which can only mean a lot of ranting, questions, and good humor. As I mentioned last time when I was reworking my Eldar list, I also had started considering going back to the Necrons. For the last week or so I've been tweaking a few varieties of list and think I've settled on the Necron list I'm most likely taking. 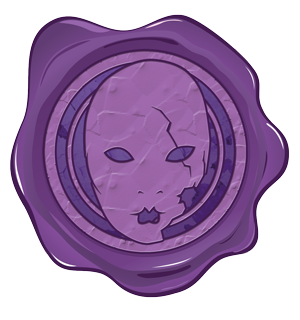 This list uses the Retribution Phalanx formation from the Start Collecting! 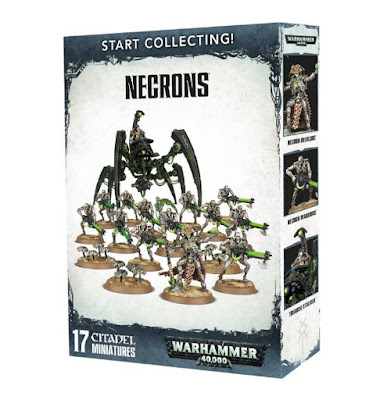 Necrons box. Last week I posted a couple lists I was considering for the NRVCon 40k Tournament at the end of April. After my game with Aidan, in which I was thoroughly trounced by Aidan's Daemon Incursion list (which went on to win elphilo's RTT at Huzzah Hobbies the following day), I felt a need to go back to the drawing board a little bit for the Eldar list. I'm also debating jumping back to the Necrons as the tournament is quickly approaching. 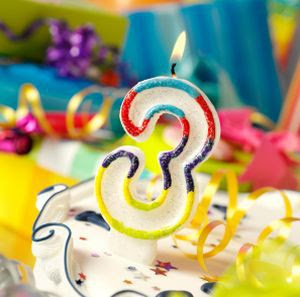 A little belated, but the blog has just recently turned three years old. Despite the slowdown in content (and podcasts) over the last 6 months or so, we're still working on generating content and keeping involved with the readers we've gathered over the last three years. It is thanks to you that we keep coming back to this, even as life gets full and busy at times. I just finished up Phil's Deathwatch Marines to a display quality. These are some amazing detailed and characterful models. Plenty of images below. One thing I need to work on is taking better pictures. A lot of these aren't as clean or as focused as I'd like. Nonetheless, enjoy. Tomorrow I'm getting my first practice game for NRVCon, which is using the NOVA packet, against Aidan. Just a reminder, NRVCon will be in my hometown on April 23-24; if you're remotely in the area, definitely consider coming down for the 32-player tournament. The top 4 will continue on to single elimination rounds on Sunday. A bit more information here, and registration here. With that out of the way, on to list building. I've more or less settled on Eldar as my army for the event, so let's get into it. As I mentioned on Monday, this week marks the first week of me working full time as a commission painter (in addition to being a stay-at-home dad, so full time is more like 4 hours a day if I'm lucky). In addition to painting, I've started a Patreon page, as well as created a new website just for my commission service. The website is primarily a portfolio of completed work; I'll still include in progress and completed project posts here. Today marks my first day alone as a stay-at-home dad. With this, it also marks my first day devoting nap time to commission work, which I'm looking to do more or less full time. 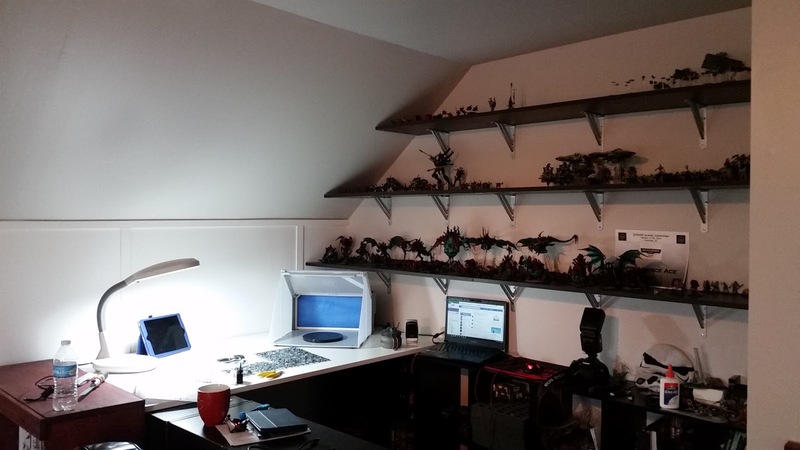 In support of this, over the last couple weeks, my amazing wife suggested and helped build up a pretty awesome studio area for me in our house. Nearby are plenty of baby hangouts and supplies. For our second game of the gaming weekend, Chris made some minor changes to his previous list, while I decided to change things up and run Neverborn. After revealing schemes I chose to try out Zoraida over Lynch. Unfortunately for this report I didn't take any pictures, so excuse the ensuing wall of text. In February we had the third installment of The Beast Arises series, The Emperor Expects by Gav Thorpe. As with previous reviews from the series, SPOILER ALERT for the remainder of the article. A couple weeks ago I hosted the guys for a gaming weekend. On Friday night, Chris and I got in a game of Malifaux. He brought Rasputina using her box and a couple other minis. I picked through my Gremlins collection to come up with a list based on the Strategy and Schemes.